A shaman is someone who is considered to have access to, and influence in, the spirit world. They can communicate with the good, evil and the animal spirits, and can bring that energy into this world – in order to do this they go into a sort of dream-like state, in a ritual, in order to access the other world. In this slot game at BarbadosBingo.com, the Shaman will attempt to communicate with the good spirits (the lucky spirits) to bring you a good game. You may even be able to enter the spirit world yourself, with assistance from the Shaman. Eyecon is slowly becoming recognised for its slot games, as they’re becoming more widely available to players. Its parent company is Playtech, which is a giant when it comes to the online gaming world, and it’s obviously bringing Eyecon into the wider world. They already have a huge portfolio of online slot games – all designed in a unique way, with loads of interesting bonus features. If you enjoy tribal inspired Barbados online slot games give some of their other games a go, like Aztec Rising, and Shaman Spirit. Catch a glimpse into the tribe that the Shaman belongs to by stepping foot in his village. The reels are set in the woods of their village and are filled with Native American symbols such as eagles, dream catchers, American Indian huts, totems, daggers, white buffalo and American Indian people. The reels are also put together using wood and feathers, which really adds to the Native American Indian tribe feel. Wild symbol – the white wolf is the highest paying symbol on the reels and it’s also the wild symbol, and it substitutes for any other normal symbol on the reels. If it contributes to a winning payline, your winnings will be doubled! Scatter symbol – the scatter is the dream catcher, and depending on how many you land in one spin you’ll be awarded with different multipliers: two symbols doubles your bet, three symbols triples your bet and so on. Also, if you land 3 or more symbols in one spin you’ll be awarded with 15 free spins along with the 3x multiplier! More free spins can be triggered within the free spins round. Gamble feature – you’ll also be able to gamble your winnings after every winning spin: if you win you’ll double your winnings, but if you lose, you lose everything. 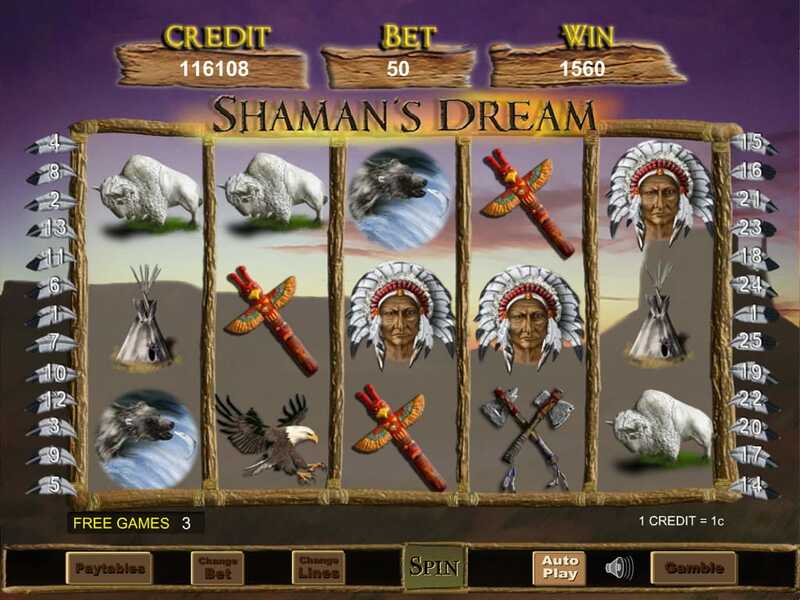 Shamans Dream has some great animations and graphics and is a high-quality slot game which really transports you into the world of the Shaman and his tribe, with the sound effects and the symbols. It’s a game that’s easy to play, but also pays well – especially with all of the multipliers within the game, and it’s got an RTP rate of 95.44% with players coming back for more! 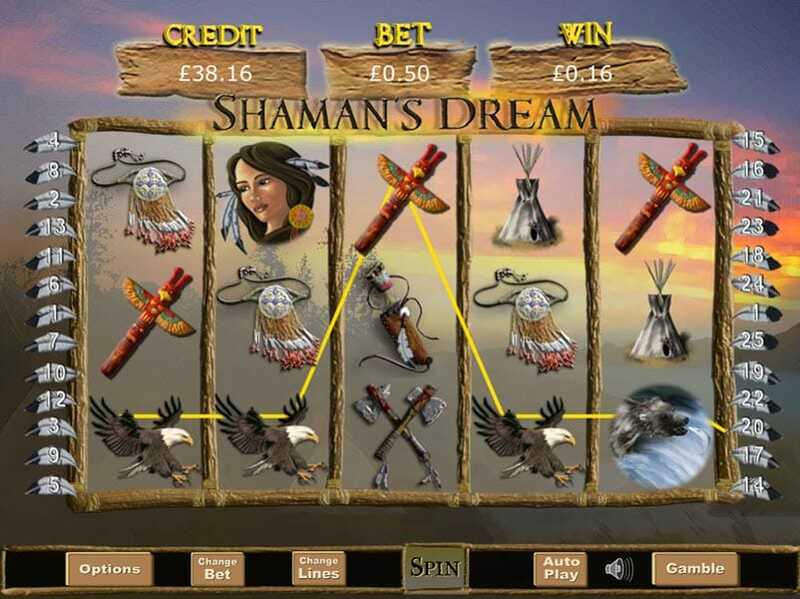 If you enjoyed Shaman's Dream why not try casino slot game - Fluffy Too.